WOW, WHERE CAN YOU FIND SO MUCH VALUE FOR SUCH A GREAT PRICE? 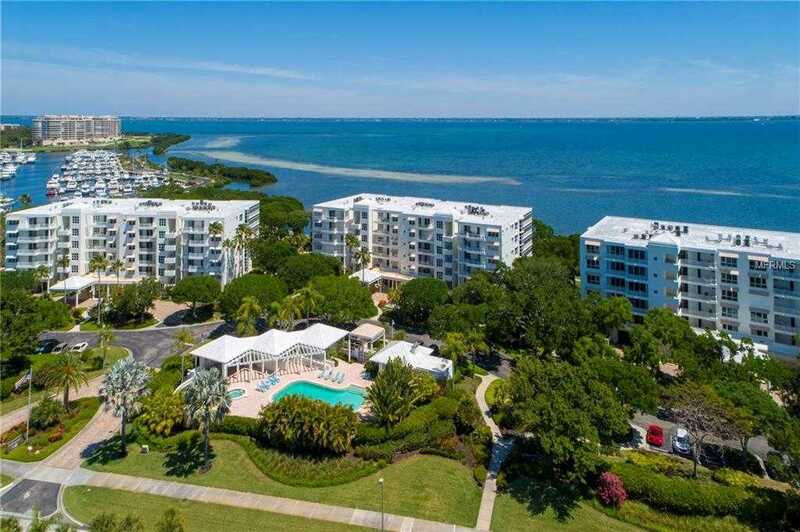 Marina Bay, with only 60 residences, is a well-kept secret nestled in a secluded part of Bay Isles on beautiful Longboat Key. This spacious three bedroom, two- and one-half bath condo lives like a single-family residence with approximately 3080 sq. ft. You will enjoy having your morning coffee or your candlelight dinner overlooking spectacular Sarasota bay and city skyline. This beautiful condo features lovely plank flooring in main living areas, new tile on both terraces, hurricane/storm shutters, sun blinds and plantation shutters. Other features include a wet bar, wine refrigerator, ventless fireplace, granite kitchen counters, many new appliances including AC units and lots of storage in the beautiful built-in cabinetry. Your guest will love the remodeled guest bath along with the privacy the quest room affords opening on to a private terrace. The third bedroom is presently being used as an office-den but can easily accommodate additional overflow guests. Marina Bay is adjacent to the Longboat Key Club Moorings Marina accommodating up to 150-foot vessels. Conveniently located near famous St Armand 8217;s Circle, restaurants and shopping. Marina Bay 8217;s amenities include on-site management, tennis courts, fitness center, kayaking, heated swimming pool and spa. Membership to the private gated Bay Isles beach club located on the Gulf of Mexico is included in the HOA fees. Bring your small pet they will love living here too. Additional Water Information: Private gated beach on the Gulf of Mexico deeded with Bay Isles Association Membership. Please, send me more information on this property: MLS# A4432417 – $1,099,000 – 2450 Harbourside Dr #233, Longboat Key, FL 34228. I would like to schedule a showing appointment for this property: MLS# A4432417 – $1,099,000 – 2450 Harbourside Dr #233, Longboat Key, FL 34228.